A popular, go-to commercial sports drink is Gatorade. Gatorade has been around for 40+ years. For decades, professional athletes and people who exercise have depended on this product to replace electrolytes during exertion. I remember how popular this beverage was even back when I was child in the 1970s. So, people have been consuming this product for decades, but … are the ingredients safe and natural? What exactly does “engineered with the science of Gatorade” mean? To me, it means created in a laboratory, and not naturally as would occur in nature. That immediately tells me it’s something I don’t want to put in my body. When I engage in exercise, I want something real and natural that will support my body’s need for replenishment, minerals, and electrolytes. Water, sugar, dextrose, citric acid, natural flavors, salt, sodium citrate, monopotassium phosphate, gum arabic, ester gum, color. Citric acid typically does not originate from citrus fruits, but instead from an industrial process that is generated from mold. Ester gum is an oil-soluble food additive derived from wood rosin to allow oils to be suspended in liquid. Gum arabic is derived from the sap of the acacia tree, and is generally considered safe for consumption. My own personal preference is that I prefer not to consume anything generated by an industrial process, which I assume likely has been due to the type of product in which it appears. Natural flavors are not natural at all, but created in a laboratory using industrial processes. Monopotassium phosphate is used as a fertilizer and fungicide. Anything ending in -ose is a form of sugar. I wonder, why does this product require not one, but two types of sugar? Ginger, filtered water, sea salt, organic sugar, fresh squeezed lemon juice. Ginger is a natural plant that has numerous documented digestive, immune, and medicinal properties. Sea salt supports the body’s need for natural, trace minerals. Lemon is a real food that has potassium and Vitamin C, important for antioxidant support and immune system health. Organic sugar is produced without harmful pesticides or chemical fertilizers, contains important trace nutrients, and is not of genetically-modified origin. Deepens and broadens nutrients in foods including vitamins, minerals, and makes them more available, or more digestible to our bodies. The ginger in a ginger bug allows the gathering of yeast and beneficial bacteria, which break down sugar in the culture to produce lactic acid. This acid generates carbon dioxide. As carbon dioxide is produced, the liquid is now alcoholic. This effervescent trademark of fermented soda beverages does not contain enough alcohol, however, to cause intoxication. The production of carbon dioxide produces the fizz or effervescence in the finished ginger bug ‘soda.’ Alcohol is also a byproduct of the lacto-fermentation process; but don’t worry, the ginger bug isn’t fermented long enough to produce anything beyond negligible amounts of alcohol. Because the sugar is consumed by the culture during fermentation, the end result will be a strong gingery taste with less sugar taste than commercial sodas. Combine ginger root, water, and sugar in a glass jar. Stir gently with non-metal spoon. You may need to add water to bring your liquid level to about 1″ below the top of the jar. Cover with a cheesecloth or tea towel. I place a rubber band around mine to secure it. It may be helpful to label your ginger bug with tape. On the tape, write the date and what you are fermenting. 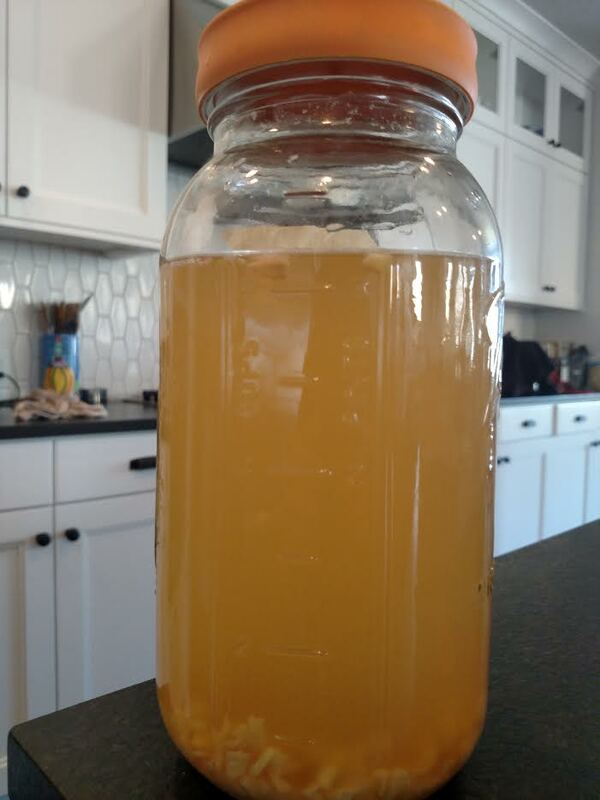 You will want the ginger bug to ferment for about 5-6 days before using. Each day while in use, you will feed 1 tablespoon grated ginger root and 1 tablespoon organic sugar to the jar. When you do this, check to see if your starter has bubbles and appears effervescent. Stir gently, replace cheesecloth or tea towel on jar, and return to its fermenting site. If your starter does not have bubbles or develops mold, discard and start again. Once your ginger bug is established, you can store in the refrigerator when not in use and feed 2 tablespoons grated ginger, 2 tablespoons sugar, and 2 tablespoons filtered water once a week. What should I do with excess “ginger bug” when I continue adding to the culture, but I’m not using my ginger bug? You will use about 1 cup of your ginger bug for a starter in this recipe. Besides your ginger bug starter, you will prepare a ginger tea. When the tea has cooled, you will combine it with the ginger bug to make ginger ale. 1-2 inches of ginger root, grated or finely chopped. If you want a more gingery taste, add a bit more. Prepare a “tea” with 4 cups of water, grated ginger, sugar, and sea salt. Bring mixture to a boil. Allow to simmer for about 5 minutes. The sugar will dissolve, and soon, your “tea” should start to smell like ginger. Remove “tea” from heat and add remaining water (6 cups). Allow to cool to room temperature. Pour into 2 liter glass container. Add lemon or lime juice and stir. Place lid on tightly and leave on counter for 2-3 days, perhaps longer if you want more fermentation. After 2 days, you can open the lid and test it, but if you want to make sure your ale is quite fizzy, I don’t recommend opening the lid until the mixture has sat for at least 3 days. When you open the lid, you should hear fizzing and see bubbles, just like in any carbonated soda beverage. If you want fermentation to slow down considerably, place jar in refrigerator. If you don’t mind additional fermentation while you consume your ginger ale, leave on the counter. I prefer to have mine at room temperature and leave on the counter. Keep in mind the longer your ginger ale sits, the more fermented it will become. You can strain the ginger out, if preferred, or leave it in as long as you are drinking the ginger ale. The flavor and fermentation will vary depending on the batch you make, temperature, and length of time you leave your ginger ale to sit. I usually place my ginger ale and ginger bug in my pantry with the door closed. The temperature in my pantry is typically anywhere between 73 and 75 degrees. Note: when storing your ginger ale on the counter or in the refrigerator with a lid, considerable pressure can build in your ferment. Using caution is advised when opening, as the release of gases produced by the ginger ferment can cause forceful explosions. What fermented beverages do you make and enjoy? You know I am a passionate ginger fan! Sharing at Studio B. THANKS!! Such a great alternative to Gatorade. I cringe every time I see someone drinking that! I LOVE your side by side comparison of ingredients!! Also, you make me laugh: “What exactly does “engineered with the science of Gatorade” mean?” Hehe, seriously, they had to brainstorm the wording on that one. What a delicious and healthful beverage you’re making, what fun. I love this Raine! I bet it tastes amazing! So much better than any of that store-bought junk. Question, do you peel the ginger? It’s such a pain to peel it! Heather – yes, I do. I have read in some instances where people don’t peel, but I can’t verify the results of that activity. I do wonder if not peeling can be a cause of mold to occur? Not sure. I love ginger ale. Can’t wait to try this.